Production model of HondaJet took its first flight on June 27 at North Carolina. Honda Motor Co. took a step closer to realizing its “Civic of the Skies,” the unofficial nickname for the private jet in development by the Japanese car maker. The production version of the HondaJet made its initial flight on June 27, according to the company, which hopes to get the plane certified and put into service next year. The plane lifted off from Piedmont Triad International Airport in North Carolina and climbed to 15,500 feet during the 84-minute flight, reaching a speed of about 644 kilometers per hour, according to Honda. The unusual design of the jet, which mounts the engine over the wing instead of under it, is aimed at maximizing cabin space, reducing cabin sound and boosting fuel efficiency. The plane seats up to five passengers. Honda is taking orders in North America and Europe for the aircraft, which is priced at $4.5 million. 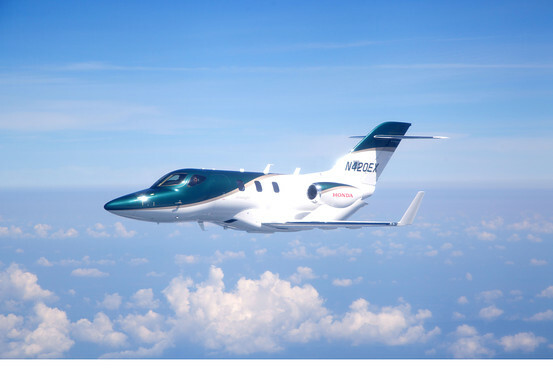 It will compete with other small jet planes from established manufacturers including Textron Inc.’s Cessna Aircraft Co., Embraer SA and Cirrus Aircraft Co. Honda has said it thinks some customers will buy the plane for personal use like family trips, as the WSJ reported last year. Honda Aircraft Co.’s headquarters are in Greensboro, N.C., the state where the Wright Brothers made the world’s first airplane flight in 1903. Japanese companies are looking to take a bigger role in a global aircraft market currently dominated by a handful of players in North America, Europe and Brazil. On June 26, Mitsubishi Heavy Industries Ltd. mounted engines on its first test aircraft in the Mitsubishi Regional Jet program, which seeks to build 70- to 90-seat aircraft for regional airlines.